Here's an interesting live event that integrates film and stage. Film reviewers have commented that certain productions create characters so real that they climb right out of the screen. Well L. Birch literally does. In the film - bearded, on the stage - bald and uniquely lit, Birch seeks desperately to free his love who is being held captive on some sandy shoreline in the images on screen. The screen flickers in 1920's silent film style, highly-contrasted, black and white. 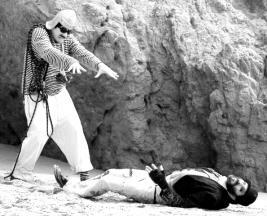 However, the shaky camera and often jump-cut sequences, make getting used to the production as rocky as the beach. Fortunately, in their tribute to silent films, the producers include a loving humor and we as the audience are able to laugh a little at these quirky characters amidst the seriousness of love lost. Ultimately, we're captured by the charm. Writer/Director Randy Sean Schulman explores various ways for his character (Birch) to interact with the stage and screen intermittently. At first, it's exciting, eerily surreal, but as the production continues, becomes less so. He uses a sort of slow modern dance and his apt face to express feelings of love, common to all of us. He's quite endearing. We root for him. But in the end, unless I've missed something (and I certainly may have), I'm left wondering what greater message has been displayed here. Oh, and great brochure art by Shaun Barrios. Luminous Birch And the Splendor of the Colorless Light of Emptiness. www.luminousbirch.com Copyright © 2009. Based on the April 5th, 2009 performance at Greenway Court Theatre, Los Angeles. www.greenwayarts.org. Written and Performed by Randy Sean Schulman. Produced by Greenway Arts Alliance and Lauda Flores and Randy Sean Schulman.